Makkos is going through old newspaper ads from the mid-19th century that plug all different kinds of fights between all different kinds of animals. 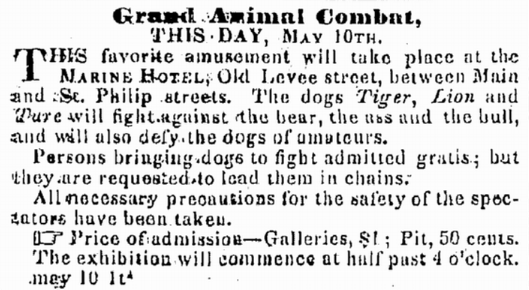 An ad from the Daily Picayune for a fight between animals. This is just one of hundreds of details Makkos can cite from his collection, meticulously organized in his letterpress studio on St. Claude Avenue. The space is packed with printing materials, machinery, drawing desks, files on files on files, and the smallest of supplies — from thumb tacks to salvaged letterpress type organized by font in countless compartments. From his archives, Makkos pulls out an old card he found from a 1950s bubble gum box. This is what turned him on to bullfighting in New Orleans. The front of Makkos' 1953 Bowman Frontier Days Trading Card. The back of Makkos' 1953 Bowman Frontier Days Trading Card. 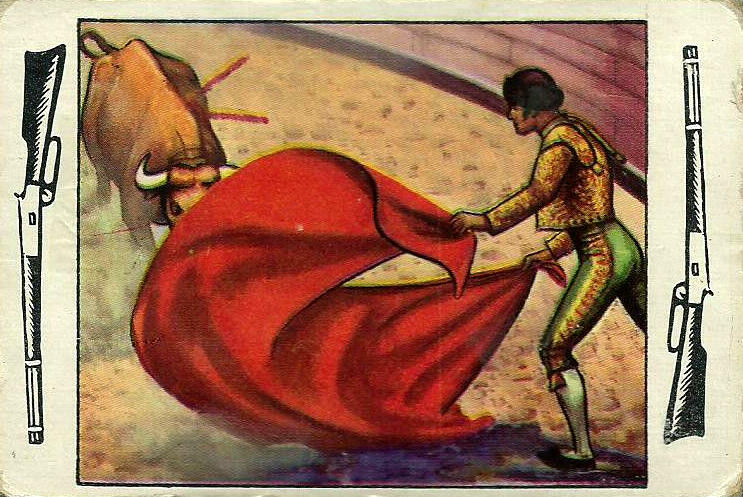 The bull and bear fights actually started with traditional bullfighting, matador and all, brought by Latin American immigrants. Sports were a good common ground for immigrants in this port city. And there was one head honcho behind many of these fights, with a name that was born to be el jefe: Jose Pepe Llula. Legend has it that Llula settled all his disputes via dueling, and never lost. Of his various business pursuits, he purchased St. Vincent de Paul Cemetery — the one that still exists in the 9th Ward. People say that’s where he buried all of his dueling victims. What really got Llula counting paper was turning traditional bull fighting into full-blown animal combat. His name appears all over the newspaper ads. 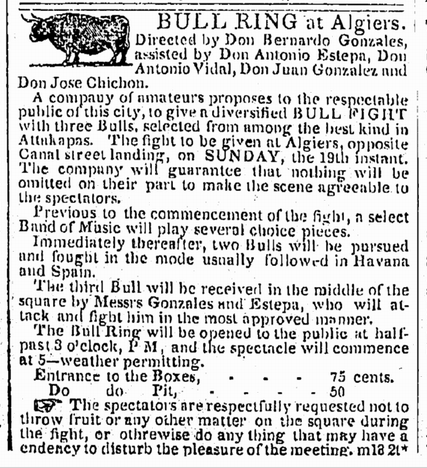 Newspaper ad from May 1844. 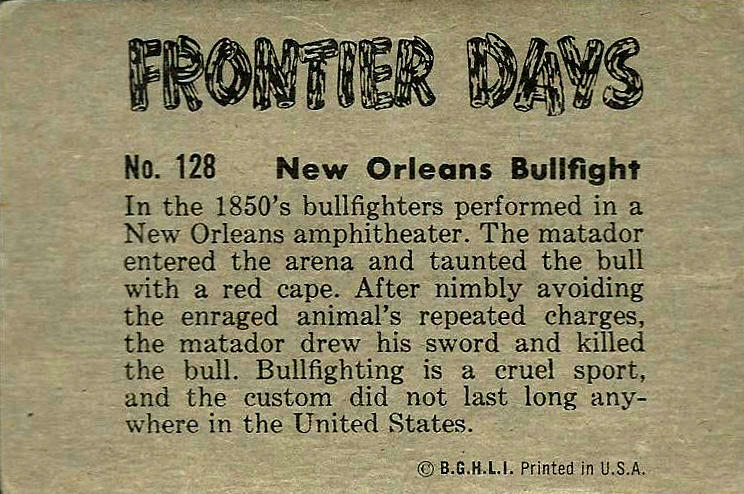 These clippings boast Algiers as headquarters for both traditional matador bullfights, as well as the bull-vs.-other animal battles. The flights were pushed across the river from other neighborhoods; animal fights used to take place in locations like Congo Square, and Washington Square between Frenchmen Street and Elysian Fields Avenue. Hans Rasmussen is a librarian at LSU. He says the city had split opinions about these fights, and so the sport got punted out of the city center. So the seedy sport found its seedy home. And everyone came out, the rich, the poor, even families! And we know this because kids were half-price. Ironically, people felt the fights between animals were more humane than the Spanish-style bull baiting. “Anglo-Americans even to this day don’t quite understand bullfighting, because it doesn’t seem fair for a team of men with weapons to fight a bull,” says Rassmussen. “Whereas to Spaniards, they can’t comprehend this because it’s an art, it’s very much a ceremony and a ritual. So Americans preferred the bear and bull fights because it was two animals on equal footing, fighting each other with their natural weapons and no interference." But where’d they get the bear?! Joseph says trapping and selling animals was popular during this time. The front cover of Illustrated News, Saturday, April 23, 1853. 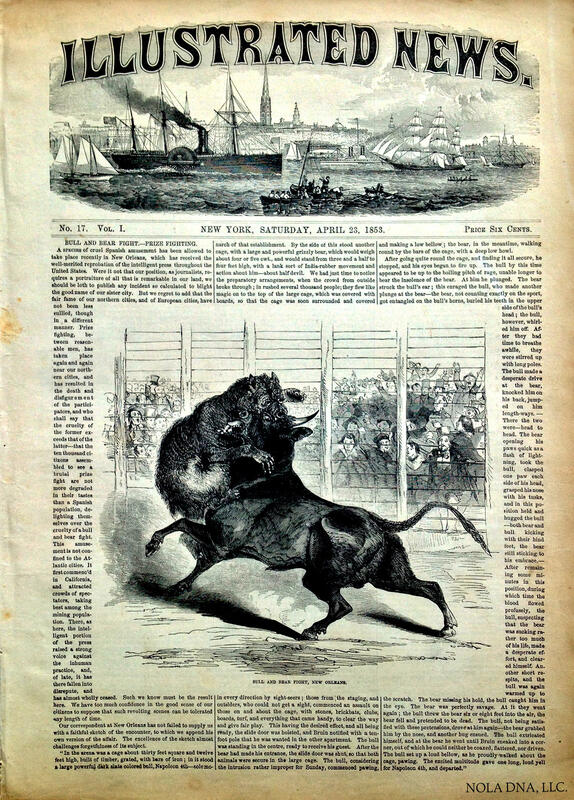 The piece goes on to describe the scene: there are two iron cages in the center of the arena, each about 30 feet by 12 feet, caging the bull and bear respectively. Thousands of onlookers watch as the cages open. The bear enters the bull’s cell, and the door slides down again, with both animals now in the same cage. Remember the beginning of the article? It scornfully describes the South. The journalist expresses reluctance to even cover something like this, but at the same time, the nation couldn’t look away. In Rassmussen’s words, the news of Pepe Llulla’s Algiers bullfights up North provoked "howls of disgust from Yankee moralists." This put pressure on politicians to outlaw the sport, which they finally did in December of 1856. “For the first half of 19th century there was conflict between new American settlers and French Creoles for control of the city, and by the 1840s it was evident that the Anglos were going to run things. So by the 1850s things like animal fighting and other traditional customs fell out of favor,” he says. Bullfighting helped different ethnicities find community at a time when American cities weren'​t welcoming to newcomers. But a more Americanized New Orleans looked down on, and eventually squashed, this Latin-rooted sport. Still, let it be known — bullfighting lived down here, thanks to Jefe Pepe. And as Joseph Makkos said, it was a thing. This story has been revised to reflect the following correction: The original text of this story reported that cockfights are illegal "in this country" today. Although all 50 states and the District of Columbia now ban cockfighting, the practice is still legal in Puerto Rico, and in other U.S. territories. New Orleans has various ways of transportation to get around the city including ferries, streetcars and buses. However, in 1958 New Orleans planned to create a new form of getting around: a monorail. The idea of creating the monorail came from the city's urge to remain modern and keep up with Houston, which had recently passed New Orleans as the largest city in the region.